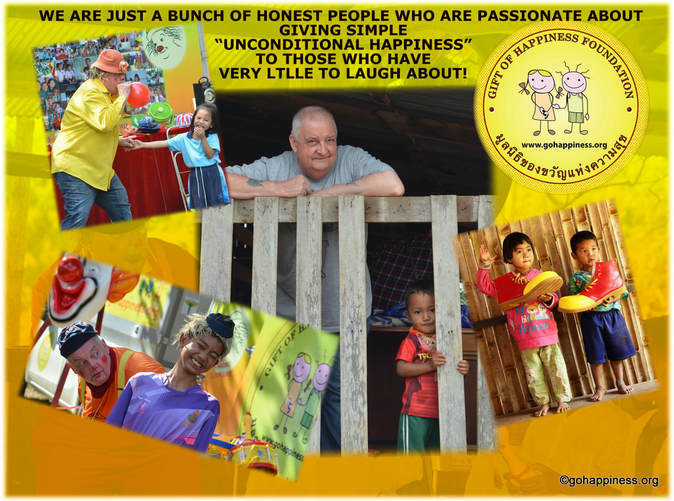 Gift of Happiness Foundation (GoHF) provides unconditional free professional comedy entertainment and very much more to thousands of needy people who never have anything much to be happy about! A legally registered not-for-profit, non-government charitable organisation in the Kingdom of Thailand. ​Member of the League of Foundations of Thailand. To serve individuals and families living in the poorest communities in Thailand. Gift of Happiness Foundation (GoHF) provides positive sustainable development through educational comedy show productions provided by world class professionals and trainee entertainers. The charity also delivers many tons of educational materials, clothing, toys, medical supplies, toiletries and bedding to an average 2,000 needy people in Thailand, every month of the year. The charity produces monthly aid giving projects that provide essential supplies to needy families, schools, medical centers and orphaned children in Thailand. GoHF is managed by a team of dedicated volunteers and is not tied to supporting just a few children at only one location. Therefore, this unique organisation has the freedom to provide joy to thousands of children in urban and remote locations throughout the country. Orphans, vulnerable street children, Bangkok slum dwellers, families living on garbage dumps, AIDS centers and facilities housing physically or mentally challenged children. We regularly serve medical centers, crisis centers for abused women and children, communities of migrant worker families and people displaced by civil war who live in refugee camps. Gift of Happiness Foundation helping people living on Garbage Dumps and remote poor communities in Thailand. Gift of Happiness Foundation pledges to ensure that 100% of public and corporate donations will go directly to fund our projects. Our Founder, Eddie Haworth describes why he’s so passionate about this little charity? It wasn’t until I reached my early 40’s, when faced with a life threatening trauma that I realised I’d never really had a happy childhood or even a stable adult life. I reached that realization following some expertly administered therapy that I needed to help recover from years of mental instability, alcoholism, depression and attempted suicide. Through the therapy, I learned to face up-to the mistakes I had made and the pain I suffered. Then in my early 50’s I started to discover the mistakes have made me smarter and the pain has made me stronger. "The beautiful thing about giving happiness is that nobody can take it away from those who receive it".